Tonight's meal from Niger is a deceptively simple yet delicious traditional dish that can be served as is or along side grilled meat, rice and vegetables. Black-eyed peas (which I love in any way, shape or form), onions a hot chili, and an egg to bind the ingredients are all it takes to make these golden fritters. Be sure to include a saucer of hot sauce for dipping to bring out the flavor and give them a peppery kick. Located in Western African, Niger (named after the river Niger), is a landlocked country. The largest nation in West Africa, 80% of the land is covered by the Sahara Desert. 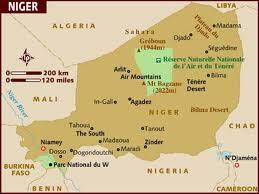 Niger shares its borders with Nigeria, Benin, Burkina Faso, Mali, Algeria, Libya and Chad. As such, the country is within close proximity of current turbulent political uprisings and change. Niger is a predominately Islamic country, which supports itself primarily through subsistence farming and some export agriculture. Because the country is land locked, mostly desert and lacking in education and health care services, it consistently ranks lowest on the UN Human Development Index. Culinary influences in Niger come from European as well as Arabic traditions. Spices such as saffron, nutmeg, cinnamon, ginger and cloves flavor the food. Grilled meat and local vegetables, black eyed peas, onions, hot chili peppers and coucous are commonly used cooking ingredients. Wash and allow the beans to soak for 2 hours, then remove the skins by rubbing a few of the beans at a time together in your hands. Wash away the skins, then use a blender to grind the beans to a smooth paste. Blend the onion and chilis into the bean mixture and beat with a whisk for 3-5 minutes. Add the salt and beaten egg and beat into the mixture, whisking for another 3-5 minutes. Heat the oil in a wok and deep fry the mixture one tablespoon at a time until golden brown. Drain on paper towels and serve with hot sauce. Final Assessment: Who knew that just a few ingredients could make such tasty fritters. Of course the fact that they're fried doesn't hurt, but the flavor, combined with the peppery heat of the hot sauce was both delicious and filling...and my kids scoffed them down! Thank you, Elina! You're right - for fried food, they were very light - thanks for connecting!